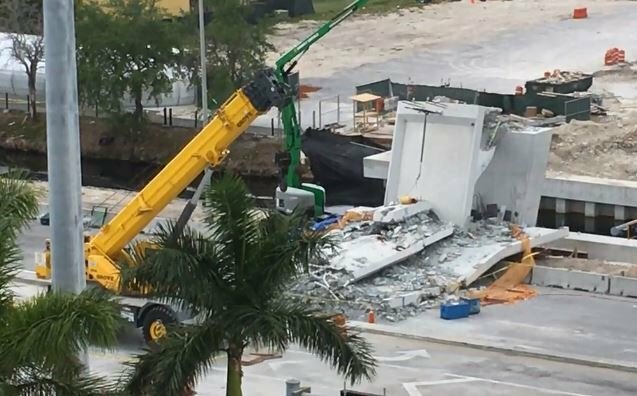 MIAMI (AP) — Construction of the pedestrian bridge that collapsed and killed six people in the Miami area was behind schedule and millions over budget, in part because of a key change in the design and placement of one of its support towers. Documents obtained by The Associated Press through a public-records request show that the Florida Department of Transportation in October 2016 advised Florida International University and its contractors to move one of the bridge’s main support structures 11 feet (3 meters) north to the edge of a canal, widening the gap between the crossing’s end supports and requiring some new structural design. The span’s signature, 109-foot-tall (33-meter-tall) pylon was to be built atop a base at the span’s northern end. It was designed for basic support and to contribute to the aesthetics of the bridge, which was touted as an architectural marvel that would connect the rapidly growing university to the nearby community of Sweetwater. In their winning 2015 proposal, designers said the bridge provided “spectacular views” for both pedestrians using the bridge and drivers passing beneath it. They added that the tower could serve as a safety feature because it would have an “eagle-eyed location” for additional lighting and security cameras. Videos of Thursday’s collapse show that the concrete, prefabricated segment of the bridge started crumbling on the same end of the span where the tower redesign occurred, two days after an engineer on the project reported cracks in the same location. The segment that failed had been placed atop the pylon’s footing, and the taller tower section was to be installed later. U.S. Transportation Secretary Elaine Chao has ordered her department’s inspector general to conduct an audit of the bridge, according to a news release Tuesday from the U.S. Department of Transportation. The agency awarded millions of dollars to the project. It is still unclear if the design change contributed to the failure. But emails between the school, contractors, Sweetwater city officials and permitting agencies show a project that was behind schedule, which had officials worried that further delays could jeopardize the federal funding. When the bridge collapsed, the project was already running about $2.6 million over its $9.4 million initial budget, cost-tracking documents from February show. Originally scheduled to be completed in July, the finish date had been pushed back to January 2019. Difficulties began in late 2016, when the Florida Department of Transportation emailed project officials saying they wanted more room to allow for future widening of the U.S. highway under the bridge, according to the documents. The new position of the tower would be on the north side between the road and the canal. “This ... places the current location of the pylon in conflict with the extra travel lane and would require bridge design modifications,” Alfred Reyna, a transportation department employee working on the bridge project, wrote in an email. After weeks of back and forth, it was decided to move the pylon 11 feet to the north, sitting near the edge of the canal. According to documents, initial costs for the new design were $204,540, with another $402,723 for construction changes. The final cost was not divulged. “The city attorney is advising us not to speak about anything to do with the bridge,” said Sandra Antonio, a spokeswoman for the city of Sweetwater, which was working with FIU. The tower was to be located on the Sweetwater side. Crews with cranes have been working to clear the collapsed bridge's debris off the road. Don Silver, a spokesman for Munilla Construction Management, or MCM, the Miami-based construction management firm that won the bridge contract, said the National Transportation Safety Board forbade engineers or contractors from talking about the project pending its investigation. MCM collaborated with Tallahassee-based FIGG Bridge Design on the bridge project, which also declined comment. A spokeswoman for FIU, Maydel Santana, declined comment on the pylon redesign, but did confirm Tuesday that the bridge was expected to be completed early in 2019 and the grant ran out on Sept. 30, 2019. She also said the school was cooperating with the NTSB’s investigation. While the NTSB probe has just begun, multiple engineers who reviewed the documents obtained by the AP said moving the tower after the bridge’s initial design invited errors. Henry Petroski, a Duke University civil engineering professor, said even seemingly minor changes in a bridge’s design can lead to failures. “Once a design is completed, subsequent modifications tend to be suggested and approved without the full care that went into the original design. This has happened time and again in bridges and other engineering structures,” he said. The documents show that further time pressures were put on the tower redesign due to a bottleneck at the U.S. Army Corps of Engineers. The Corps was in charge of permitting certain aspects of the new tower’s footing and other elements but had stopped due to federal budget cuts. Documents show the contractors wouldn’t begin work until the Corp’s permits were finished, and FIU worried delays could jeopardize federal funding. Kenneth Jessell, FIU’s senior vice president for financial affairs, in 2017 worried the delays would jeopardize federal TIGER funds for the university’s massive transportation redesign, of which the bridge was a key part. In the news release announcing the audit, Transportation Secretary Chao said she wants to know whether the parties involved in the design, construction and testing of the bridge complied with standards required of projects that receive federal funding. Bridge engineers who reviewed photographs of the collapse said it was ill-advised to move the pylon after completing the initial design, but that more analysis was warranted before it could be known whether this played a role in the collapse. Robert Bea, a University of California, Berkeley engineering professor, said the tower base may have been more flexible after it was moved closer to the canal. This could have created more stress on the section that collapsed when crews removed temporary supports so traffic could resume, he said. “At this time, I do not think the movement of the footing for the pylon to the north was a primary factor in the failure. However, the movement of the footing led to the requirement for one of the temporary steel supports to be relocated to be able to travel on the highway,” he said. Associated Press writer Adriana Gomez Licon in Miami contributed to this report.